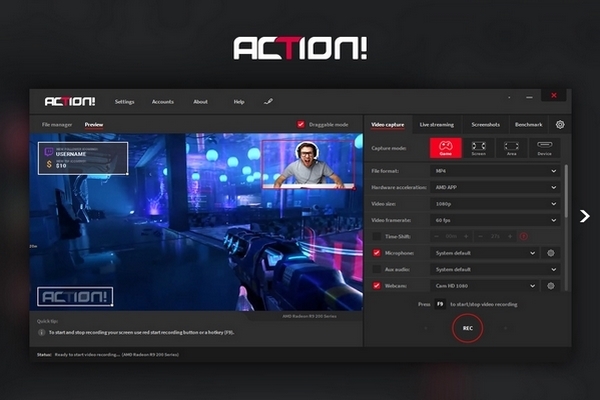 The most popular screen recorder and gameplay recording software Mirillis Action! screen recorder allows streaming and real-time recording of Windows desktop in a superb HD video quality. With Action! you can record and stream your gameplay, web player videos, record music, capture screenshots, add webcams, microphone commentary. 1. The most user friendly and stylish interface of all screen recorders! Action! is compact, stylish and user friendly. Built-in screen and gameplay recording manager allows to browse, delete selected items and export recordings to popular formats and devices. Action! screen recorder defines new standard of user experience for games benchmarking, gameplay and Windows desktop real-time recording software. Action! gives you Greenscreen Mode. Now you can cut out the background, while recording with your webcam, from your video recording. You don't need to have special camera for that - all you need is Action! screen recorder and any solid color background, what is much cheaper solution and gives the same, if not better, results. Outstanding screen and gameplay recording performance and GPU utilization allows the smoothest real-time HD gameplay recording ever! Display current and average game framerate (FPS) during gameplay and save your benchmark results. Action! defines a new standard of performance for gameplay and desktop recording software. It uses Mirillis ultra-fast, multicore optimized, proprietary video codec (FICV - Fast Intra Compression Video standard) which together with highly optimized application engine provides the ultimate performance of real-time HD video recording. Action! screen recorder also captures video directly to MP4 format utilizing NVIDIA NVENC, AMD APP or Intel&#174; Quick Sync Video hardware acceleration. Action! LIVE Streaming service allows to stream all your gameplays, videos or desktop activity to popular streaming services like Twitch.tv, YouTube, Smashcast (hitbox), Ustream, Livestream, Facebook, Aliez and more! With Action! screen recorder live streaming is easy and fun! Screen recording with automatic webcam background removal using Intel&#174; RealSense™ technology! 10. Screen recording with automatic webcam background removal using Intel&#174; RealSense™ technology! Download and install Action! screen recorder with Intel&#174; RealSense™ technology support and add webcams to your screen and gameplay recordings using automatic background removal option! Learn more about Intel&#174; RealSense™ technology! Upload Windows desktop and gameplay recordings to YouTube™ or Facebook. Export and upload your screen recordings to popular services and social networks like YouTube™ and Facebook. Action! provides predefined exporting profiles for YouTube™ and Facebook, just push a button to export and automatically upload your screen or gameplay recordings to your favorite service fast and easy. Smooth HD Windows desktop recording, screen recording and easy tutorial creation! 12. Smooth HD Windows desktop recording, screen recording and easy tutorial creation! With Action! Active screen recording mode you can record your videos continuously, no matter how many times you switch from Windows desktop to fullscreen gameplay and back. All your Windows desktop actions and gameplay will be recorded to a single video file. This makes Action! perfect PC screen recorder!